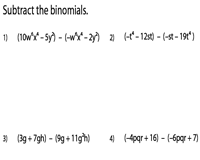 Subtracting binomials worksheets offer substantial practice for high-school students with performing subtraction of binomials and monomials and subtracting between binomials. 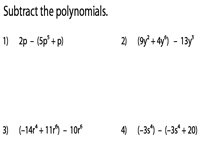 Few worksheets may require students to combine the like terms to find the difference between the binomials. The worksheets are offered in single and multi-variables with multiple levels of difficulties. 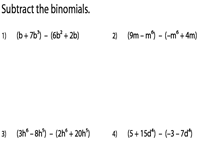 This set of worksheets require students to perform the subtraction of binomials and monomials in a single variable. The coefficients are offered as integers in level 1 worksheets. Level 2 contains fractions and integers. 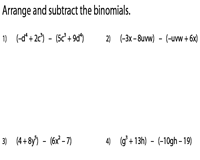 This section contains exercises on subtracting monomials from binomials. 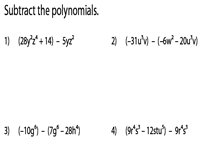 The binomials are expressed in multiple variables. Remove the parentheses to perform the subtraction here. Combine the like terms and express the answer in the simplest form. This set of printable worksheets introduces basic binomial subtraction involving multi-variable. Regroup the like terms to find the difference. The binomials are required to be arranged vertically and subtracted for the final outcome. Practice eight unique problems per worksheet with varied coefficients for each level. 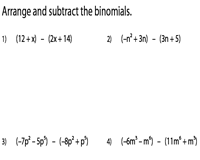 Arrange the binomials in the vertical form to perform subtraction. The worksheets are offered in two levels of difficulty.